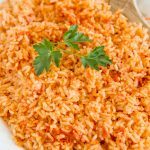 The BEST Authentic Mexican Rice that is so good and so easy, it will become THE side dish to make with all of your Mexican dishes. 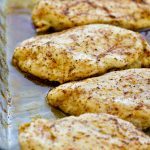 By far, this is one of my favorite and most requested recipe to cook. We make it for any Mexican dish from taquitos, to tacos to burritos. It’s truly an authentic Mexican Rice recipe. You want to know why? Because it comes from an authentic Mexican kitchen…that just so happens to belong to my cousin’s mother-in-law! My cousin shared this recipe with me years ago. She was taught by her mother-in-law, who is from Mexico. The ingredients are pretty simple – white rice, tomato sauce, garlic, chili powder and Caldo de Tomate (affiliate link). 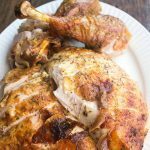 I realized a few months ago when I was looking for this recipe on my site to share it with someone, that I’d never shared it! The first step is to brown the rice by cooking it with some vegetable oil over a fairly high heat. When the rice starts to turn white and then golden, you’re ready for next step, which is basically just adding the rest of the ingredients. Once it all comes to a boil, cover it up and turn down the heat. A clear lid is helpful here so you can see when the rice is done, but really 20 minutes is about all it takes. If after 20 minutes there’s still some liquid in the pan, just let it continue to cook until all of the water is absorbed and you can no longer see it bubbling to the top. Let it rest for several minutes, then fluff it up in the pan using a fork or wooden spoon, and you’re ready to serve. Sometimes I’ll add some frozen vegetables, like peas and carrots, or even chicken like in my One Pot Mexican Chicken & Rice. 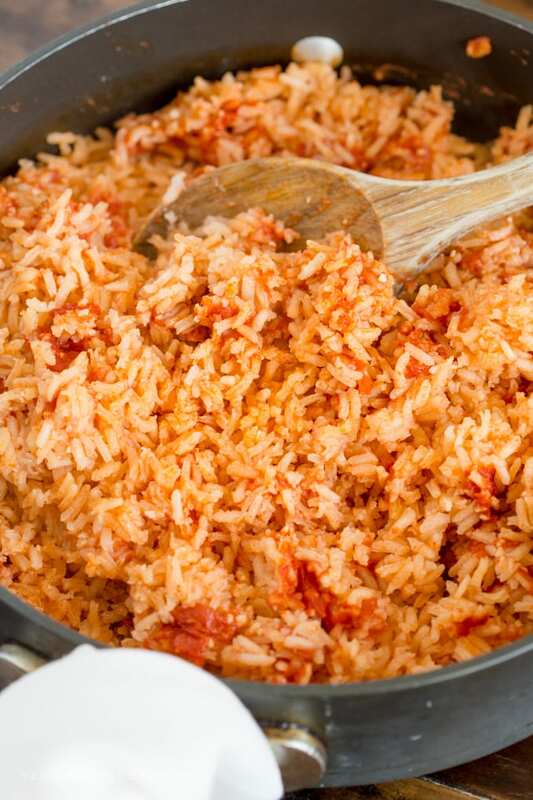 Use a good quality nonstick saute pan for cooking your Mexican Rice. The rice never sticks, and it has higher sides so there’s no chance or and of the rice going overboard while stirring! Do not use stainless steel pans for cooking rice. 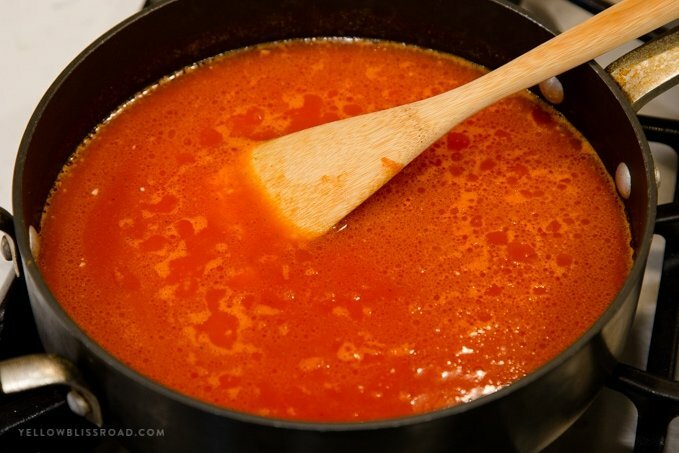 What can I use as a substitute for the Caldo de Tomat? I have been asked this many times so I thought it was important to share that you don’t have to use this ingredient. Chicken bouillon would be a fine substitution, although it wouldn’t have the same tomato taste. You could also simply use chicken stock instead of water and leave the bouillon out completely. BUT, I definitely recommend it since it will give the best, most authentic flavor to your Mexican Rice. My rice didn’t cook all the way through in the 20 minutes. Since each kitchen and stove is different, it’s hard to say what could have gone wrong. However, typically it’s just that the heat wasn’t high enough and the rice didn’t come to a full boil. Let it cook a little longer to absorb more of the liquid. Or, remove the lid, turn up the heat to medium and let any remaining liquid boil off. One of these solutions should work for most problems. This isn’t a traditional Mexican rice recipe! How dare you! Ok, so this isn’t a question, but I do hear this from time to time. My response to this is that each kitchen, family, and family tradition is different. 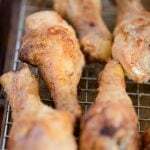 Just like in the US there are about 18 different types of barbecue sauce depending on what part of the country you live in, the same goes for Mexico and authentic Mexican Rice recipes. Just because it isn’t the same as what your family cooks, doesn’t make it wrong or bad. Please be respectful of this recipe as being authentic to my family. 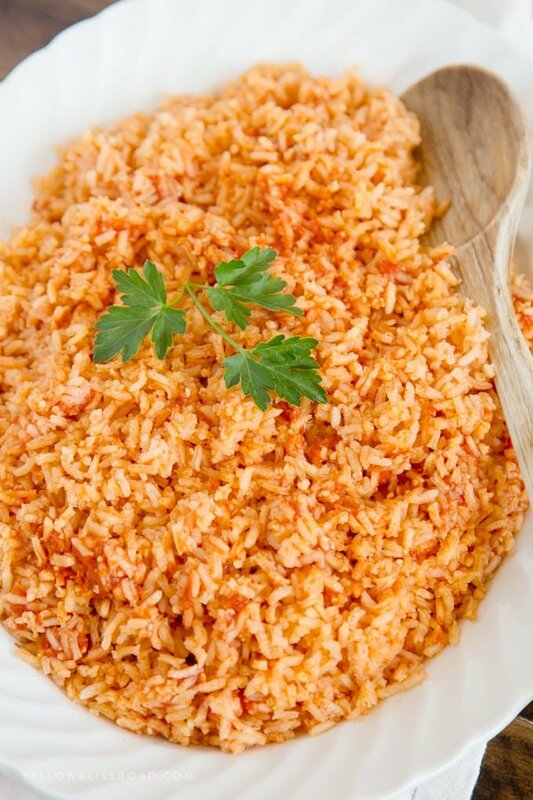 Watch this video to see how to make my Easy Mexican Rice recipe! Where do you get that tomato bouillon? I haven’t made this yet but don’t think I’ve seen it at my grocery store. Amazon?? 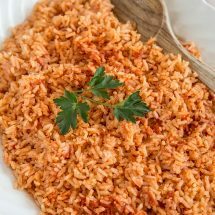 Love rice so will definitely try this! You can find it in the hispanic section of your grocery store, and if you can’t find it there it’s available on Amazon. Yes, it’s more about the amount that you use. Loved this rice, I have cooked it twice now for our church dinner. Nice! thanks for stopping by Donna. Tasted great! ABOUT how many servings should this recipe make? 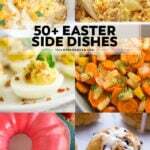 It depends on how big your servings are, but in our home it can make about 5-6 servings. What type of chili powder ? Just regular ground chili powder. Could you tell me how to make this for 50 people? I have only ever doubled the recipe, making it times 5 would be a feat, so I’d probably make 4 separate batches. Thanks for sharing your suggestion Itzel! Hello, How many does this serve? This recipe will serve 4-6, depending on the size of your servings. Made this in the Instant Pot last night and it was sooo good. It had more “sauce” than on the stovetop, but it was tasty. Keeper. For sure. Thanks for posting this! This was an amazing recipe. 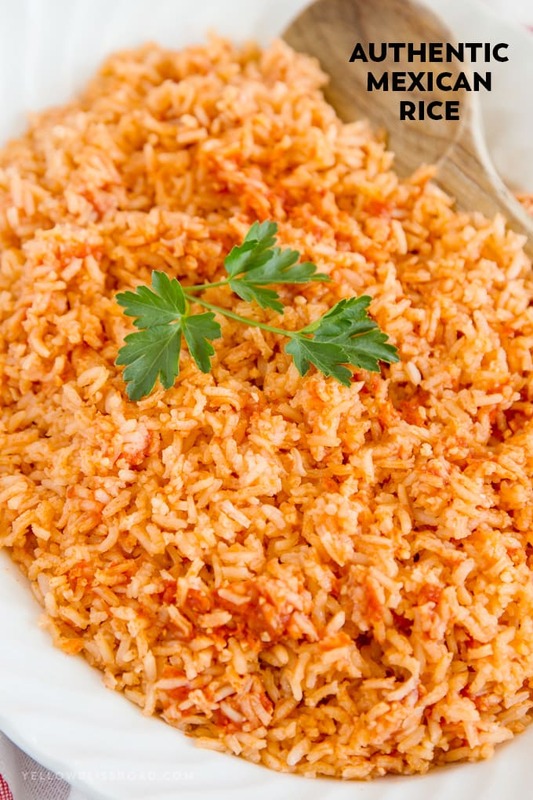 I was looking for the perfect quick Mexican rice recipe and this was IT! Turned out perfect for me. I did leave it a smidge too long in my stainless pot and it stuck but very little. Otherwise, the recipe is one I will make again and again! Plus – it got 5 stars from EVERYONE in my family, which is nearly impossible to do! Thanks so much for sharing! 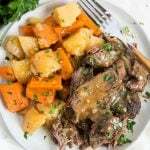 Just tried this in my Instant Pot. I had previously did it on the stove top with great results. The rice was way more stickier in the Instant Pot, but I doubled the recipe and I will try again. The flavor was fabulous. Trying to make a large batch for a shower. I think I will add more water/chicken stock (I used stock) and less tomato sauce. Will let you know how that goes in the pressure cooker! Thank you Ellen! and thanks for sharing your experience! I only own stainless steel pots and pans and have for about 50+ years! 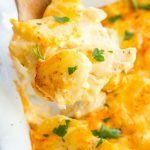 Do you have any suggestions that will allow me to make this amazing recipe? My Mom’s 855th birthday is being celebrated on Sunday and my contribution to dinner I’d the rice and beans! Help please! 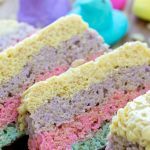 This looks like the best recipe with amazing reviews. You can make it in the stainless. I just can’t guarantee it will work. I know some people have had luck with it, but that’s never been me! If you are use4d to stainless then you might be totally fine. I made Mexican rice (not exactly this recipe but very very close) in our stainless skillet last night and it turned out just fine. I’ve found the key for us is to turn the heat down as far as it will go on our electric stove. Simmer like that for 15 minutes then pull it off the heat and let it stand, covered, for 5-10. Keeping the heat as low as possible while it simmers is key in making sure it doesn’t stick. And if it does? As long as it’s not burnt (which it shouldn’t be if you keep the heat low), so what? Just don’t scrape the bottom of the pan! I make it in a rice cooker – brown the rice in a cast iron pan first (stainless would be fine too), then throw everything into a rice cooker, and cook stirring every 3 mins until it’s tender and fluffy. That way, I can use the pan to make something else while the rice is cooking. Works out perfectly every time, I think it’s one of those recipes that’s very hard to get wrong. I always have issues cooking rice on the stove, but putting it in the oven is my secret. You can put the entire pot covered in a 350°F oven. You can sauté and stir and do everything on the stove top then for the cover and simmer part I throw the whole pan in the oven. Then I take it out and let it rest with lid on about 10 min. Soft, fluffy, perfect rice every time. Interesting, I’ll have to try that! Hi! Thank you for this! I was looking to improve my Mexican rice results. You and your readers, together, had just what I was looking for. First recipe I clicked t boot! GRACIAS! I may throw this all in my Instant Pot. I’ll may make it on the stovetop, depending on time (love to cook, but I’m a night shift nurse and choose to commute). Again, thank you and your peeps! I’ll let you know how the pressure cooker tastes in comparison. I’m rice-in-a-hurry savvy with the Instant Pot (chicken and rice for sick pups, I have 4 Retrievers, and a foster dog, who steal garlic knots and various other dietary indiscretions). Not a skill I aquired in fun, LOL. Thank you Tisa! and thanks for sharing your positive experience! I’m always looking on line to see what others are creating out there. 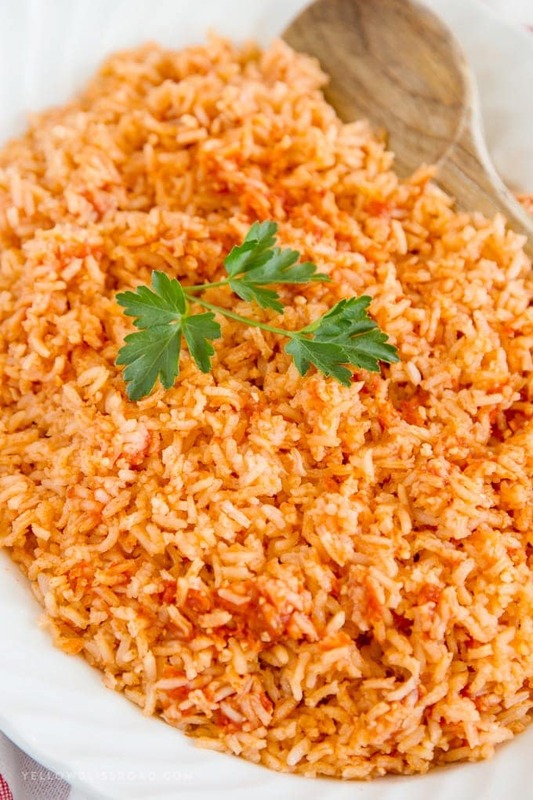 This recipes is very close to an authentic Mexican rice. My mom is from Mexico so I’m pretty picky. When we make this at home we add a few more ingredients. Try adding a seasoning you can find at any Mexican grocery store called Sazon Goya, mixed frozen veg and cutting the water in half and adding chicken broth as well. This gives it a burst of flavor. Love the video attached. Anyone criticizing this recipe would struggle to produce something not only better but easier to make. My roommate who is of Mexican heritage cannot get enough of this rice. I use it in burritos that i sell to Mexicans they rave about how good it is. How would this work with brown rice? Brown takes a lot longer to cook than white rice. I don’t know ow it would react to the saute part. IF you do try it though, please let us know how it goes. The trick for it to not become mushy is mix the tomato sauce with rice stir it first then add your water. 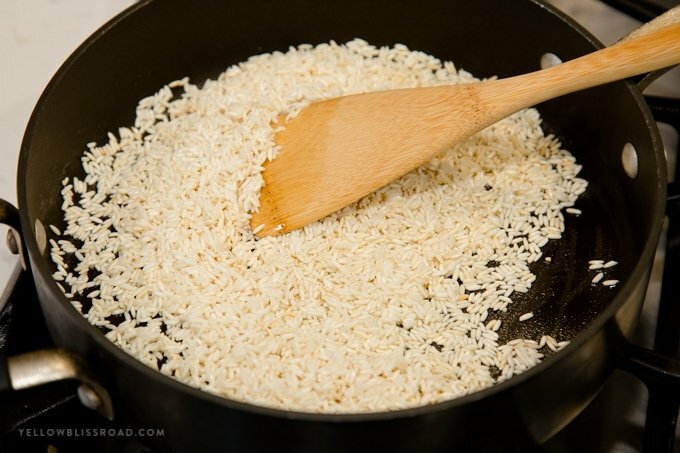 Once you add your water do not stir the rice at all. Just let it boil and cook. Once the water is low turn the heat down, place a lid and let the steam cook the rest of the way. That is a great tip, thank you Felicia! Huh. I guess I’ll keep trying and cook the sauce down with the rice first. Been trying to cut back on water in order to make it less mushy (I’ve tried this about five times now, love using the caldo), but it’s always pretty mushy. Also, I think it matters to let the water boil down a bit before covering, I’m guessing? As soon as the rice starts boiling, cover the pot. If you try to boil and reduce, that could be what’s causing it to be mushy. This certainly looks like and tastes like the Spanish rice I get in Mexican restaurants. I substituted tomato paste for the calde de tomato, and it was fine. I’m not a big fan of bullion cubes anyway — they’re mostly salt and I can’t have that much of it. Next time, I’ll add some ground cumin or ground star anise — or maybe both! I wish I had more people to feed — I halved the recipe and still had enough for at least two meals, maybe three as a side dish. I can see where this would make a delicious base for a casserole — a bit of diced frozen veg, some chicken or cheese and call it dinner. Thanks, Kristin! We love adding chicken and veggies to our Mexican Rice. Glad you enjoyed it! I haven’t heard that myself, and I’ve always used long grain rice. I loved the flavor of this rice but I think I used the wrong rice . I used 5min. Rice . It cake out to sticky . Yes that was an instant rice. You need a regular, long-grain rice. Short grain rice has more starch. That’s why Japanese people wash short grain rice before it’s cooked — you’re rinsing away a lot of the starch. I’m not sure, but I think short grain kinds of rice are an “Asian” thing. I always had a hard time finding it in the grocer — I had to go to the specialty markets if I wanted to buy it. In any event, you can probably use either one, but if you want the rice to be individual grains and be fluffy, you’ll have an easier time of it with long grain rice. Where do you get calde de tomato. I usually purchase it at my local grocery store. So, so good! I’d not use calde de tomatobefore. What a difference! Thank you! Yes! I’ll use this recipe from now on!